In my previous post I mentioned a cafe called Home Sweet Home but then realised that I had never made the original post about it that I thought I had. So here it is. Home Sweet Home is a small place that Chris and I found completely by accident one night by following some pretty lights. It looked warm and inviting so we went in. An excellent choice as it turns out. Home Sweet Home is everything it looks like from the outside: cosy, individual and friendly. They also make their own cookies fresh when you request them! Well, the dough is already made up but they don’t start baking them until you ask for them so they come across lovely and warm with chocolate that is still melty. 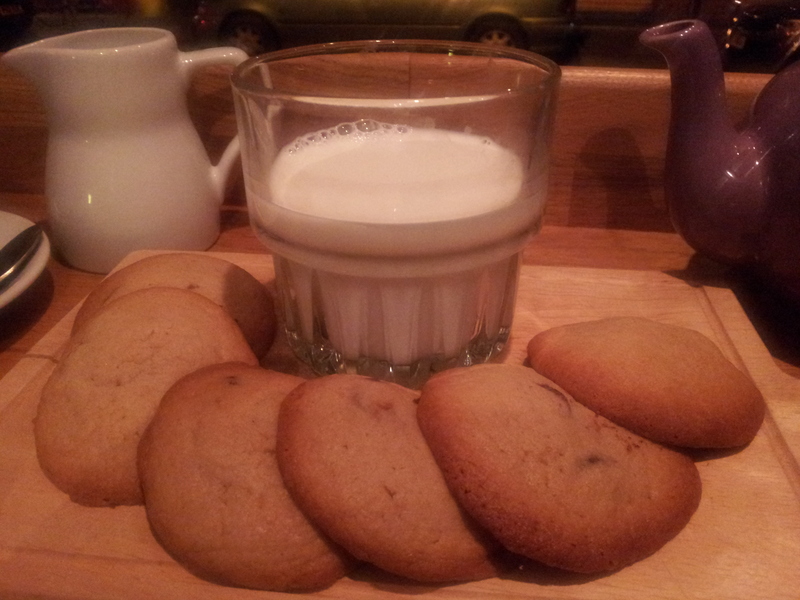 Hot cookies with cold milk to dunk. Perfect. Tea for two is served in a pot with Home Sweet Home’s own cute mugs. They also serve coffee, beer and wine but, of course, I have only had the tea! I have had friends who have tried the coffee and thought it was good though. Tea pot and cute mug. Chris' Dad asked if he could buy one at New Year and they gave him one as a present. How nice is that? Home Sweet Home lacks the pretention that some Northern Quarter cafes have and everyone can go there and feel welcome. We even took Chris’ parents! 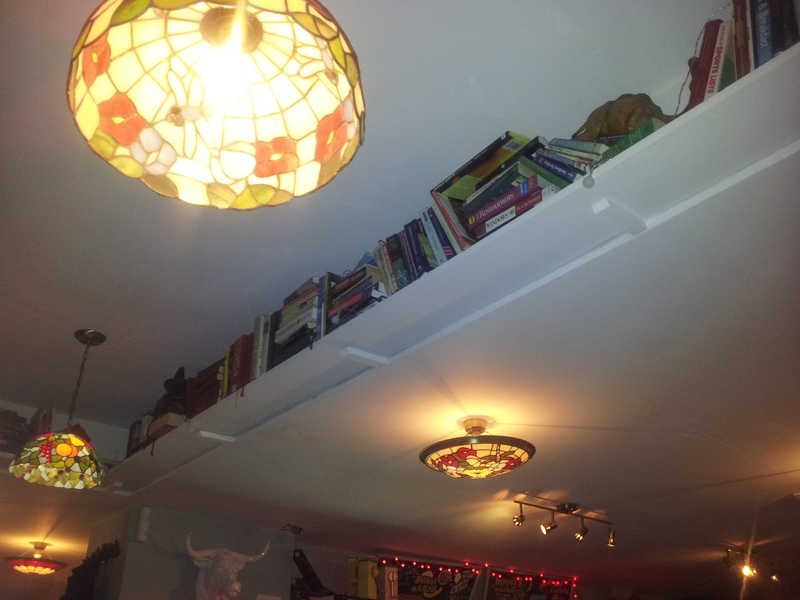 What they don’t lack is the slightly quirky decor that many Northern Quarter cafes have, the many lights that give Home Sweet Home it’s warm glow each has a different style of glass light shade, there is art on the walls, books all around and even a ‘dog’. Did I mention they are open until 11pm Sunday-Monday and midnight on Friday and Saturday? A major selling point in my books! January 28th marks two years since my boyfriend Chris and I started going out so we decided to celebrate once I had finished work for the day. Chris took me to one of our favourite restaurants Bella Italia in Bury. This is no mere chain Bella Italia but a family owned and run independent Italian restaurant which is completely unrelated. 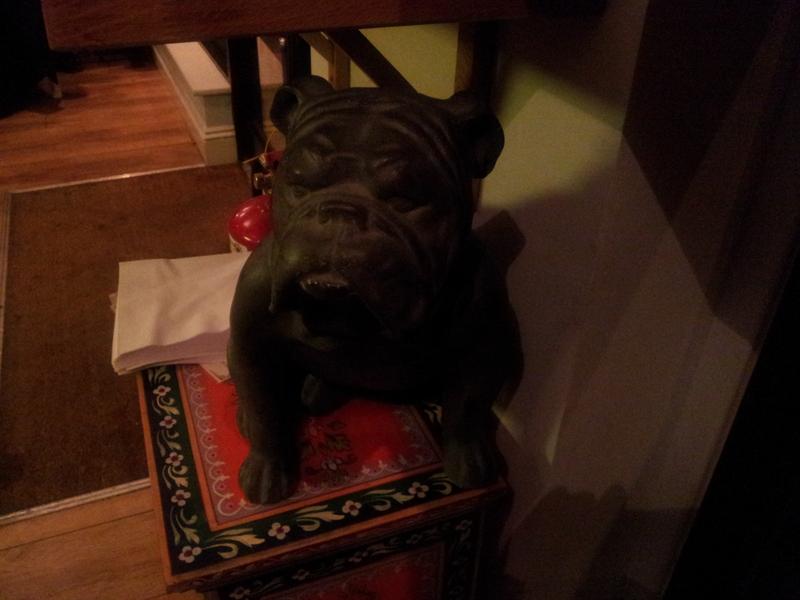 There is a warm and cosy atmosphere and the family and their staff are very personable and friendly. When we went this weekend there was a short queue (which had grown to quite a long queue by the time we were leaving) but we got served quickly anyways, in honesty it’s nice to see how well it’s doing, especially given that it is now off the beaten track with the new shopping centre in Bury. 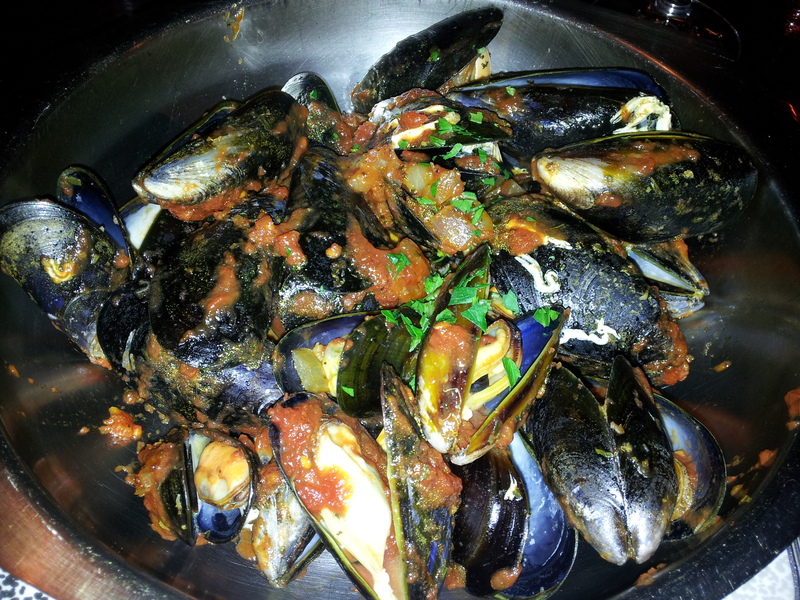 For starters we had mussels. Now I usually don’t like seafood but the tomato and basil sauce with these is so good, and they have such a meaty texture that I like them in spite of myself, I just ignore the subtle fishy taste. 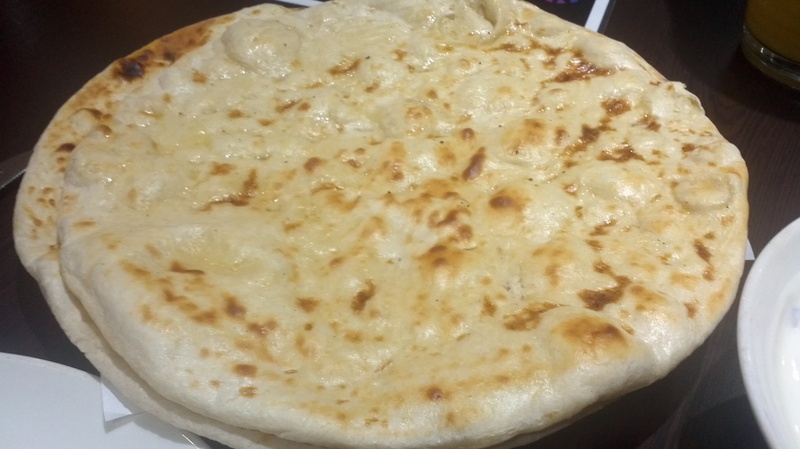 The below is a 1 person portion so you also get a generous amount. For our main course we had Trio Di Combinazione Al Forno which means you don’t have to pick between dishes! 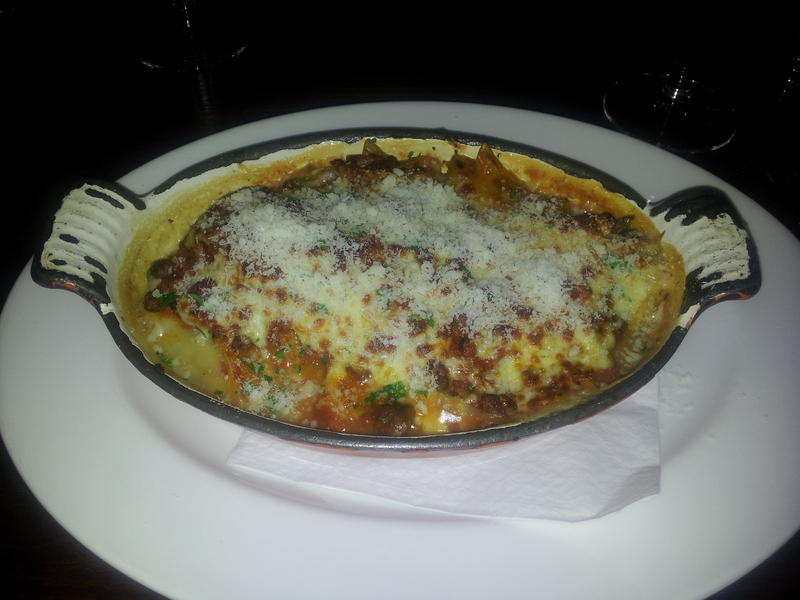 This is a great idea whereby you get lasagne, canneloni and penne bolognese all baked together in one dish and topped with cheese. Fantastic! After dinner we went for a stroll around Bury and then caught the tram home. We were going to go to Home Sweet Home for a cup of tea and some cookies but as we were getting onto the tram the bottom fell off of my shoe! Since this made walking very slow and difficult we had to settle for heading home and going out for tea today. 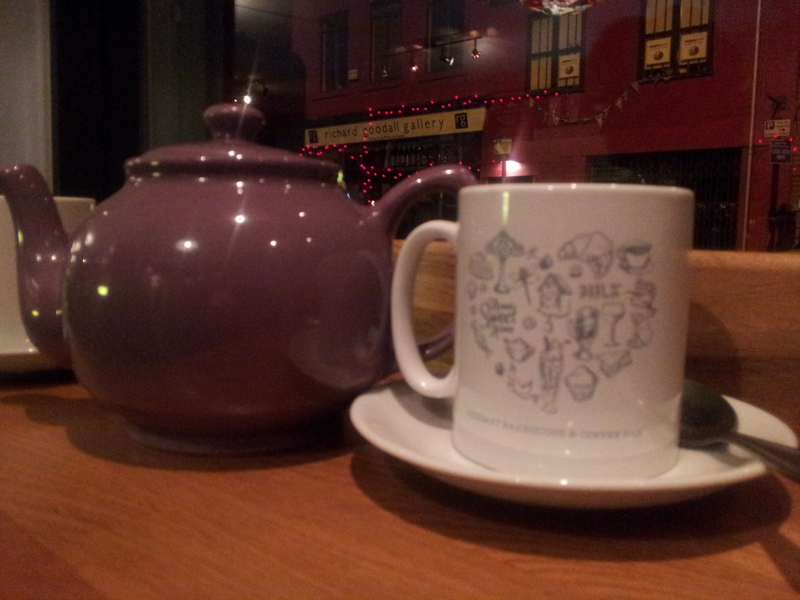 In the end we decided to try something new and went to the Earth cafe for a cup of tea. 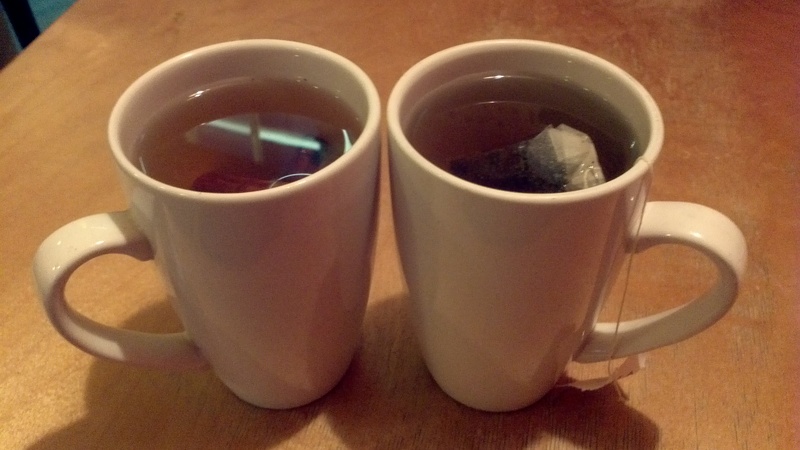 I opted for apple and cinnamon while Chris went for the unusual choice of nettle tea. 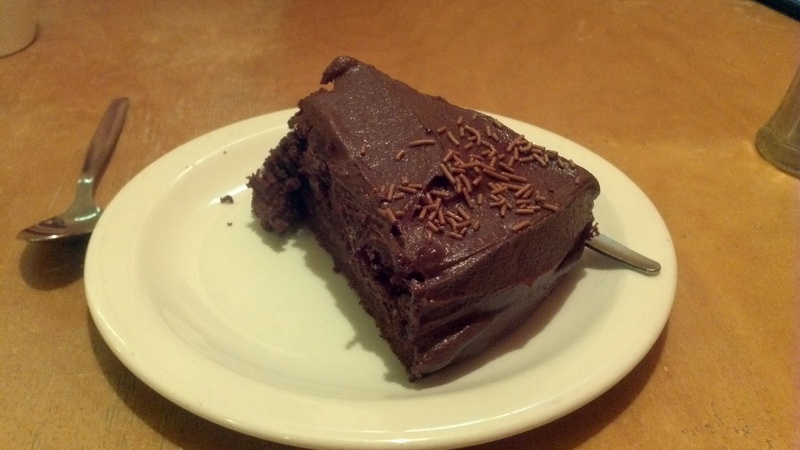 With this we decided to split a slice of chocolate cake. The chocolate was all right but had nothing particularly to recommend it however the tea was delicious. Last Wednesday I treated myself to a ballet trip. I adore the ballet, particularly story based ballets. I have also seen ballets that were purely dance and music and found the dance both stunning and impressive, but I miss the expression and depth of feeling that story ballets have. I have seen the Birmingham Royal Ballet several times before and have always enjoyed their performances. I don’t have any expertise in ballet but I have always found them to be excellent performers. I was particularly impressed with the gentleman who was playing the Beast, his dancing was very dramatic and passionate, he really brought the audience into his anguish and love, I felt huge sympathy for him. This ballet was actually written by the people of the Birmingham ballet so the music and the choreography fit together perfectly. I thought the main female dancers, Belle and the fox-lady, were both very talented (I’m always envious of the grace of the dancers) and they had beautiful costumes. I particularly liked Belle’s ball dress at the Beast’s castle and the costumes of the birds. The ball dresses in general were rag chic (if that’s a term, I like it anyways); multi-layered skirts made of slim, ragged ended pieces of cloth in a variety of colours with corset tops (with that skin coloured neck and sleeves they have to have to make sure they don’t fall down). The bird costumes were sheer skirts in the front with a puffy, multi-layered back which was a very effective tail. The stage itself was also very dramatic with the different scenes opening and closing like an inside out book. The merchant’s house descended from the ceiling and there was also a forest scene which opened up to reveal the Beast’s garden, which opened to reveal the inside of the Beast’s castle. Most of the scene changes were done either by ‘servants’ moving furniture or dark clad minions moving it. The scenery was beautiful, particularly the very grand Beast’s castle. I thought that the dull mirror on the back wall really accentuated the solo/duet dances. The castle also had floating candelabras, a chair that glided across the stage on it’s own and pitchers that filled glasses on their own, small touches that added that bit of magic and sparkle. The lightening in the castle was very dark, just picking out the dancers and small parts of the scenery which again added to the cursed feeling. And at the end everything became light! The beast’s transformation into the Prince was cleverly done, somehow he was the Beast on the funeral bed and then, in one flourish of the shroud, he was in a completely different costume and his mask was gone! The other creatures turned humans came on from off stage and pulled down all the darker colours on the walls (and the lightening was upped) transforming the dark, oppressive castle into a palace of love and joy! Ta da! I love a happily-ever-after ending. Both of these pictures feature Nao Sakuma and Iain MacKay who were the dancers at the performance I saw. Just before Christmas I posted about our work Christmas do at East z East and in that post I mentioned that Chris and I’s preferred curry house was a place in Rusholme called Shahi Masala. Since Chris recently got a new job we were out for our traditional curry celebration and it was delicious! We opted for 2 starters to share and a main each. There was a sweet chilli, a pickle, a mint, an onion and a mango relish! I prefer mango. Chris likes everything, often all at once on one poppadom! 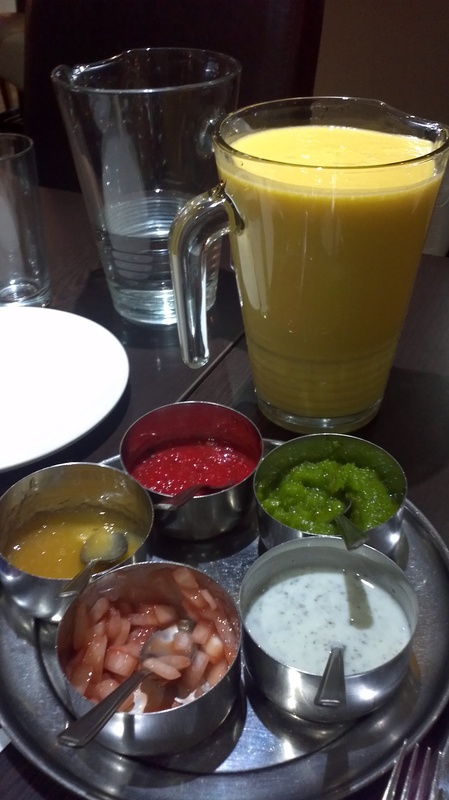 If you have never had mango lassi I would highly recommend it! 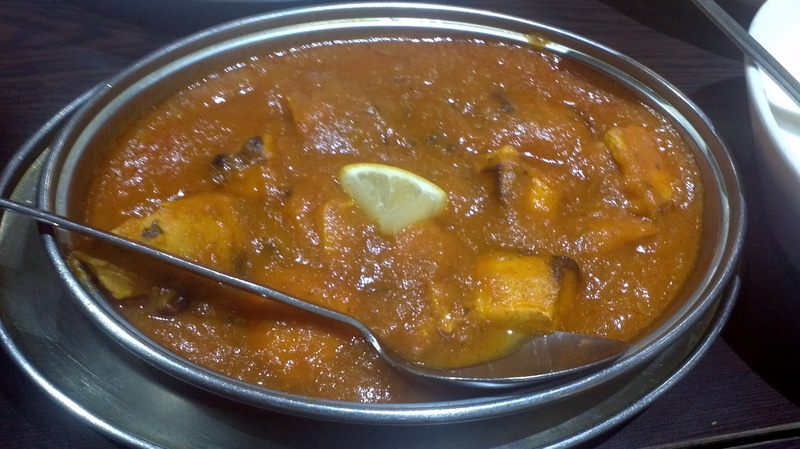 It is sweeter but an excellent soother of spicy curry. 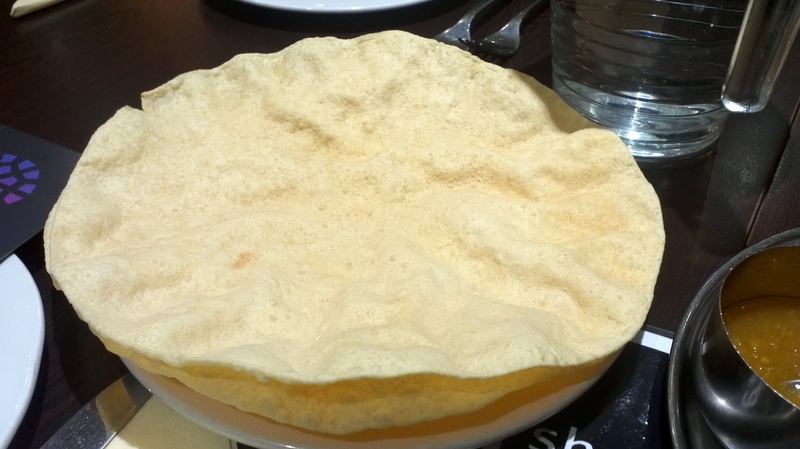 For some reason we got an odd number of poppadoms :s Maybe the waiter got peckish on his way over. 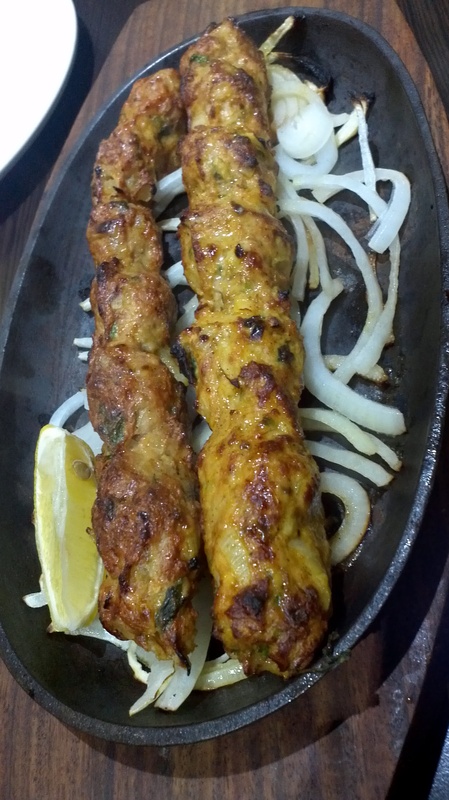 For the proper starter we had some tandoori chicken and chicken seekh kebab. 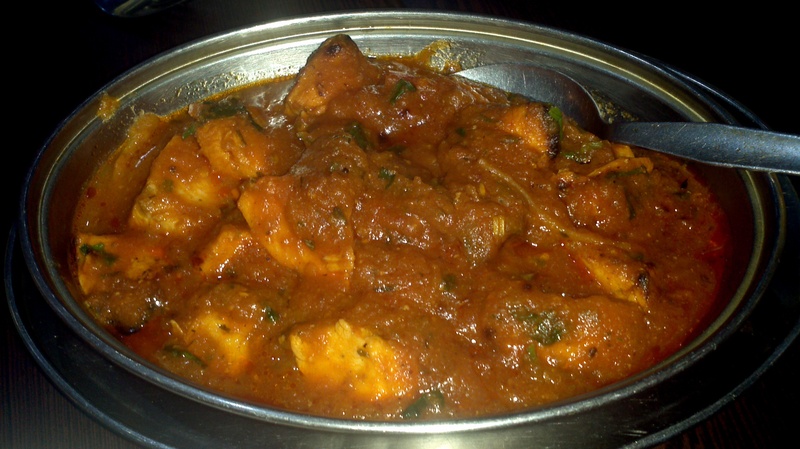 For the main course I had a chicken tikka bhuna. And Chris had a chicken tikka masala. Plus, of course, the usual sides. The service is usually excellent, we did feel that there was a slight drop in service this time, it is usually very personal, but they were quite busy. 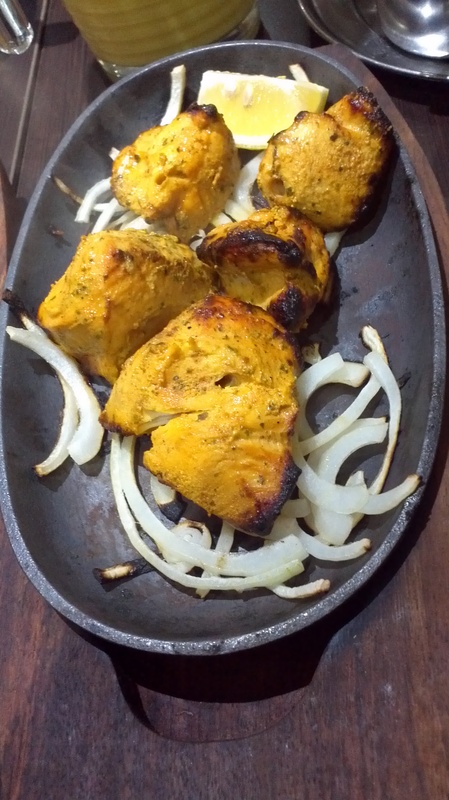 Our food was served quickly, it was full of flavour and piping hot, the chicken was good quality and tender. Overall Chris and I give Shahi Masala 8/10. A day of several short posts. Chris and I were at the John Rylands Library again this weekend and they have a charming new donation box. I thought it was particularly appropriate for this blog. I also love automata, we studied them in school and I think they are fascinating! Check out some close-ups and the website for the creator here. I decided to try and cook something new the other day, namely a mushroom cream sauce. I’m trying to learn how to make more things from scratch as opposed to just using a shop sauce and since I love mushrooms this seemed like a good one to try! It’s actually surprisingly simple. The recipe I used made enough sauce for 2 people. – Cut the mushrooms into slices or chunks as desired and add to the shallots and garlic then cook for a few more minutes. 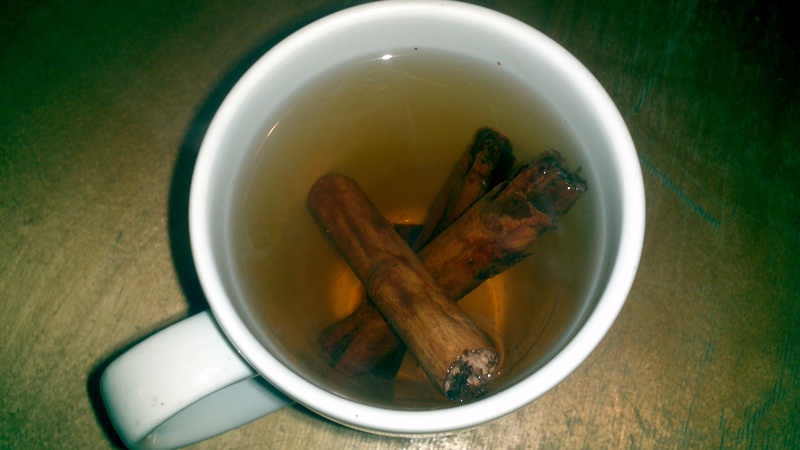 – Then add the stock (about 8 fluid ounces) along with seasoning and allow the stock to reduce to about two thirds. 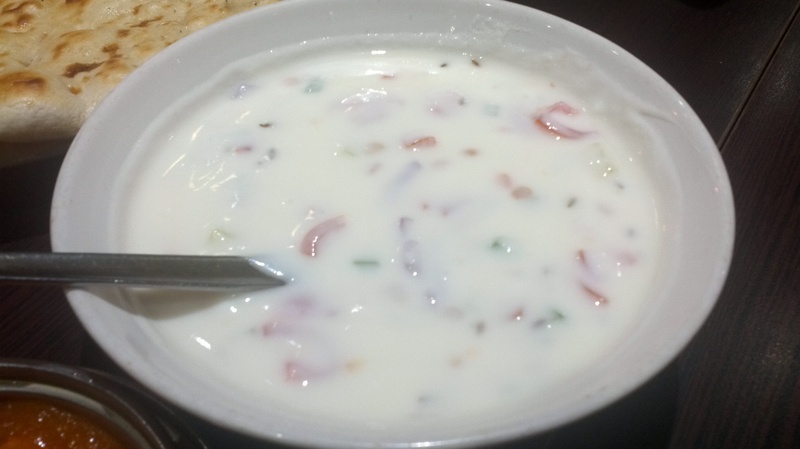 – Stir in about 2-3 tablespoons of cream and keep stirring until it thickens suitably. 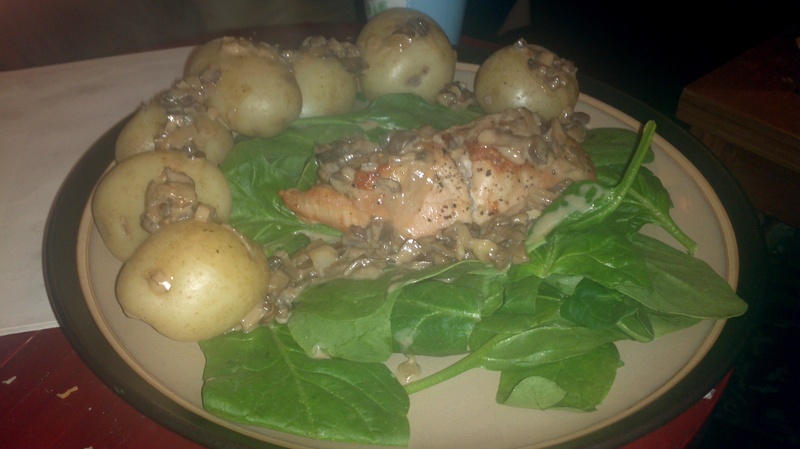 To go with my sauce (which I realise is a backwards way of dealing with a meal) I served baked chicken stuffed with cheese and boiled new potatoes on a bed of spinach. I found this site via a post on Kim’s site which was following a post on a blog site by Shoeperwoman. Polyvore is great fun, you make clothes sets or house sets! Check it out.